The best science fiction can take you to other worlds without leaving behind the basic human condition; the stories of Startling Sci Fi do this with an effortlessness that charms. Prepare to encounter cyborg assisted-living centres, virtual reality drag queens, and love rebooted from stored back-ups of transferred consciousnesses. Explore our world alongside benevolent alien symbiotes - or join the humans who resist them. No matter what dimension, time, or world you’re visiting, virtual or physical, bloody or calm, character remains king in this collection. Each tale reflects that universal human character in a different way, creating a whole that leaves the reader fully immersed and hard pressed not to read “just one more” before returning to reality. Startling Sci Fi manages to be both grounded in the genre and refreshingly unique. 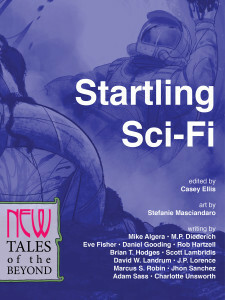 Casey Ellis should be very proud - this is a great collection of voices adding worthy stories to the science fiction world. I’ll be hunting for more from these authors, and I hope Ellis gathers more great talent in collections to come. I was lucky enough to get to read an advance copy of this baker's dozen of strange and intriguing stories, which transport the reader to places that are at once familiar and unexpected. Whether it's a band of rebels resisting an alien invasion or a castoff mutant finding connection in the unlikeliest of places on a distant world, the characters take us on a rewarding journey into being human and all the longing that goes with it. Enjoy the trip.